The kola nut is a caffeine-containing nut of evergreen trees of the genus Cola, primarily of the species Cola acuminata and Cola nitida. Cola acuminata, an evergreen tree about 20 metres in height, has long, ovoid leaves pointed at both the ends with a leathery texture. The trees have yellow flowers with purple spots, and star-shaped fruit. Inside the fruit, about a dozen round or square seeds develop in a white seed-shell. The nut’s aroma is sweet and rose-like. The first taste is bitter, but it sweetens upon chewing. The nut can be boiled to extract the caffeine. Kola nuts contain about 2- 4% caffeine and theobromine, as well as tannins, alkaloids, saponins, and flavonoids. The kola nut has a bitter flavor and contains caffeine. It is chewed in many West African countries, in both private and social settings. It is often used ceremonially, presented to chiefs or guests. In folk medicine, kola nuts are considered useful for aiding digestion when ground and mixed with honey, and are used for coughs. Human use of the kola nut, like the coffee berry and tea leaf, appears to have ancient origins. It is chewed in many West African cultures, in both private and social settings, to restore vitality. Kola nuts are an important part of the traditional spiritual practice of culture and religion in West Africa, particularly Niger, Nigeria, Sierra Leone and Liberia. The 1970s hit "Goro City", by Manu Dibango, highlights the significance of kola nuts (called "goro" in the Hausa language) to the capital of Niger, Niamey. 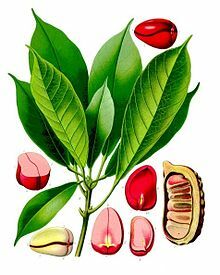 Kola nuts are used as a religious object and sacred offering during prayers, ancestor veneration, and significant life events, such as naming ceremonies, weddings, and funerals. They are also used in a traditional divination system called Obi divination. For this use, only kola nuts divided into four lobes are suitable. They are cast upon a special wooden board and the resulting patterns are read by a trained diviner. They were used as a form of currency in such West African groups as the Malinke and Bambara of Mali and Senegal. They are still used as such today in certain situations such as in negotiation over bride prices or as a form of a respect or host gift to the elders of a village should one move to a village or enter a business arrangement with the village. In the 1880s, a pharmacist in Georgia, John Pemberton, took caffeine extracted from kola nuts and cocaine-containing extracts from coca leaves and mixed them with sugar, other flavorings, and carbonated water to invent Coca-Cola, the first cola soft drink. Cocaine was prohibited from soft drinks in the U.S. after 1904, and Coca-Cola now uses "spent" leaves with no cocaine remaining, while the caffeine is now most frequently synthetic caffeine, so there is no actual kola nut in its current recipe. Regular weeding is necessary, which can be performed manually or through the use of herbicides. Some irrigation can be provided to the plants, but it is important to remove the water through an effective drainage system, as excess water may prove to be detrimental for the growth of the plant. When not grown in adequate shade, the kola nut plant responds well to fertilizers. Usually, the plants need to be provided with windbreaks to protect them from strong gales. Used in cultural traditions of the Igbo people, the presentation of kola nuts to guests or in a traditional gathering shows good will. A kola nut ceremony is briefly described in Chinua Achebe's 1958 novel Things Fall Apart. The eating of kola nuts is referred to at least a further ten times in the novel showing the significance of the kola nut in pre-colonial 1890s Igbo culture in Nigeria. One of these sayings on kola nut in Things Fall Apart is: "He who brings kola brings life." It also features prominently in Chris Abani's 2004 novel "GraceLand." The kola nut is also mentioned in The Color Purple by Alice Walker, although it is spelled "cola". 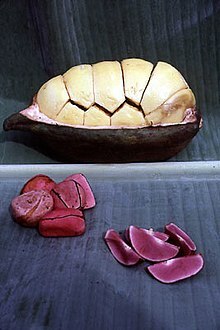 The kola nut is mentioned in Bloc Party's song "Where is Home?" on the album A Weekend in the City. The lyric, setting a post-funeral scene for the murder of a black boy in London, reads, "After the funeral, breaking kola nuts, we sit and reminisce about the past." The kola nut is mentioned in the At the Drive-In song "Enfilade" on the album Relationship of Command. The kola nut is repeatedly mentioned in Chimamanda Ngozi Adichie's novel "Half of a Yellow Sun," which also features the phrase: "He who brings the Kola nut brings life." ^ a b c Burdock, G. A.; Carabin, I. G.; Crincoli, C. M. (2009). "Safety Assessment of Kola Nut Extract as a Food Ingredient". Food and Chemical Toxicology. 47 (8): 1725–32. doi:10.1016/j.fct.2009.04.019. PMID 19394393. ^ a b Dewole, E. A.; Dewumi, D. F.; Alabi, J. Y.; Adegoke, A. (2013). "Proximate and phytochemical analysis of Cola nitida and Cola acuminata" (PDF). Pakistan Journal of Biological Sciences. 16 (22): 1593–6. PMID 24511707. ^ "Kola Nut". Igbo insight guide to Enugu and Igboland's Culture and Language. igboguide.org. ^ Odebunmi, E. O.; Oluwaniyi, O. O.; Awolola, G. V.; Adediji, O. D. (2009-01-01). "Proximate and nutritional composition of kola nut (Cola nitida), bitter cola (Garcinia cola) and alligator pepper (Afromomum melegueta)". African Journal of Biotechnology. 8 (2). ISSN 1684-5315. ^ "Cola recipe". This American Life. 1992. ^ Aina Adewale-Somadhi (2004). Practitioner's Handbook for the IFA Professional. Ile Orunmila Communications. p. 1. ISBN 978-0971494930. ^ Robinson, Charles Henry (1913) Dictionary of the Hausa Language, Volume 1. Cambridge: University Press. page 117. ^ Epega, A. A. (2003). Obi Divination. Athelia Henrietta Press. pp. 1–2. ISBN 978-1890157340. ^ Meyers, C. (6 May 2011). "How Natural Is Your Cola?". Science NOW. ^ "From Nigeria, the Kola nuts are here". Daily Nation. Retrieved 2017-12-28. ^ Osuagwu, Bertram I. N.; Pritchett, W (March 28, 2003). The Igbos and Their Traditions (PDF). p. 1. Retrieved July 30, 2018. Cola in West African plants – A Photo Guide.